This blog focuses on the world of prospect research and various related fundraising topics. To diversify our subject matter, we like to feature the work of our friends and colleagues in the community. Join me in welcoming Jeff Stein and Allison Keech Sanka of Planned Giving Marketing and please enjoy their post on planned giving. There are more big fish in your small pond than you may think (or than you’ve been led to believe). If you work in major or planned giving for a national fundraising organization, major university, regional healthcare system or other large non-profit with a donor file in the hundreds of thousands or millions, you can stop reading here. As for the rest of us, listen up. Analyzing your donor file to eliminate unlikely major and planned giving prospects from your marketing efforts could be costing you millions – literally! Donor research firms have done a fantastic job helping organizations append their donor files with all sorts of useful and insightful data. For very large organizations, with far too many donors to include in a major or planned giving marketing program, having this incremental data helps paint a clearer picture of the subsets of donors, allowing them to assign planned giving scores based on a whole slew of appended data. If you have more prospects than you can cost-effectively market to, and are generating more leads (qualified or not) than you can possibly follow up with, it’s smart to do your analysis first. But most of us don’t have that problem. If you’re like most small to mid-sized organizations you have other problems: tight budgets, small staff, too much to do and not enough time to do it, and the list goes on. But too many good planned giving leads isn’t one of them. So why would we pre-disqualify so many prospects from our marketing programs? In reality, smaller nonprofits shouldn’t. Here’s why. When we meet with our clients to formulate a marketing strategy we ask them to tell us about their most recent and most memorable planned giving success stories. It comes as no surprise that nearly everyone can tell us about an old, rich, long-time supporter of their organization who had recently passed and left nice bequest in the will. In many ways, these stories validate the conventional wisdom – planned gifts come from old, rich folks. But when we follow up with, “Any others? Any you didn’t expect or from donors you didn’t think had it in them?” their eyes light up and tales of ‘the millionaire next door’ begin to flow. Who are these ‘unremarkable’ donors making remarkable gifts? They are the volunteer who works as a greeter in your hospital’s lobby, the custodian who has set up and cleaned up after every graduation in the last 40 years, the former math professor who never misses a reunion, the booster who attends every home game of the school he never attended, the ever-present cook in your church’s food line, and the librarian who has read to generations of preschoolers at your community library. And here’s who they aren’t, generally. They don’t live in fancy zip codes, own vacation homes, show up on major gift registries, sit on company boards, or hold enough stock in a public company for the SEC to take notice. They don’t attend galas, get photographed in their tuxes and evening gowns, buy full page ads in your programs, or bid on luxury vacations at your charity’s auctions. They are not, however, ‘philanthropically invisible’. These are people you know. You know their faces and their names, because you see them around your organization, at the annual spring cleanup, working in your offices, showing up early to your annual 5K walk to help with registration, and they are always first to return the annual appeal envelope with a modest but appreciated gift. They are your most vocal and loyal advocates for your organization. They always say “yes” because they are truly emotionally invested in your cause. All the more reason to ask them to consider a planned gift. So if you base your planned giving prospect identification strategy only on wealth data, you would most likely miss these incredibly valuable prospects that are literally right in front of you. Cast a wider net to include more than just the old rich folks. You may be surprised by what you catch! While numbers tell a powerful story, your volunteers, loyal but small-level donors, and employees may not show up on the radar. Be sure to include those who are most connected to the cause in your planned giving marketing efforts, even if they don’t “make the cut” in your data analysis. We call these Invested Loyals, because they are emotionally invested in your organization with love, time and sometimes money. So here’s how to cast a wider net in your planned giving marketing, and how to prioritize. First, run your numbers on your general donor database. If you’re developing a planned giving marketing plan, consider a running your donor file through a prospect identification tool or run a few queries inside your donor management application to determine which donors have a deep connection to your organization or cause (regardless of how much they’ve given or how old they are). This would include total number of gifts, years of consecutive giving, recent/frequent gifts, volunteer status, board membership, and anyone who has made or expressed interest in a planned gift are good prospects. Draw a line where it makes budgetary sense. Next, make a list of your Invested Loyals. Cast the net as wide as you can, and be creative. Involve your board and employees in brainstorming who your biggest fans are. The important thing here is to not overthink it. Stop there. Now is not the time to drill down into the analysis and research your prospects. Prospect research is time consuming, and therefore expensive. Reaching out with a wide net will help you identify people who are most interested in making a planned gift, because they respond. Then, plan your marketing campaigns. 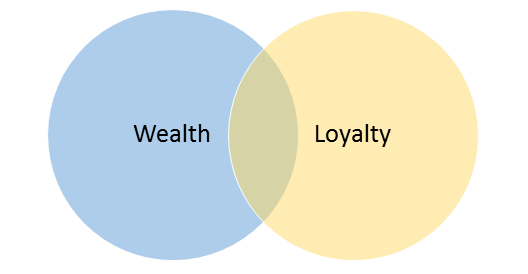 In order of prioritization for who to include in your list, identify the group in the ‘sweet spot’ where Wealth and Loyalty (Invested Loyals) overlap, then your most Loyal donors, then your Wealthy-but-less-frequent donors. Throw out your net and see who responds. When the marketing begins to work and you get responses via phone, email or visiting to your campaign landing pages, THEN do your prospect research! On those who respond, research and drill down into the data or information you can find about them from people who know them. Where else do they give? Where did they and their children go to school and college? What do they love about your organization, and why have they supported it (either monetarily or with time) for so long? Fundraising is sales. Every good sales person (fundraiser) knows that knowing your prospect will help you to engage at a higher level and guide you to towards solutions that are aligned with your prospects’ philanthropic intent and giving capacity. Before you meet or call a planned giving prospect, do your research. Just not too much before. About the Authors Jeff is 1000% dedicated to providing PGM’s clients with the best service and solutions in the nonprofit sector. In addition to running the company, he’s PGM’s “go to guy” for nearly any question about a project and is always a driving force in the overall strategic direction of your project. With 25-years experience in direct marketing, Jeff has directed an amazing scope of strategic marketing projects, particularly in higher education and independent schools. Aside from his planned giving speciality, he’s produced highly-personalized student recruitment campaigns delivered to hundreds of thousands of prospects, as well as annual reports, capital/annual campaign brochures/mailers and course catalogues. With over 20 years of marketing and operations experience and a degree from the University of Pennsylvania, Allison has held marketing posts at some of the most recognized companies in the world: Viacom, Disney, MTV, Grey Advertising, ESPN, and Yahoo! In addition, she has managed dozens of direct marketing campaigns for nonprofit organizations and schools of all sizes. When she’s not swimming laps at the pool or knitting someone a sweater, she spends much of her free time with her husband and son. For philanthropy, she enjoys supporting for her son’s school PTO by managing its marketing and website and volunteering for WHYY fundraising, Cradles to Crayons, and Philabundance.